Silversea Cruises is a privately owned mid-market cruise line with its headquarters in Monaco. Founded in 1994, it pioneered all-inclusive cruising with its first ship, Silver Cloud. In June 2018, it was announced that Royal Caribbean Cruises Ltd, the parent company of Royal Caribbean International, had acquired a 67% controlling stake in the cruise line. Executive control will remain in Monaco. Silversea's co-founders, owners and operators are the Lefebvre family of Rome, Italy. They will remain on the executive board of the cruise line under Royal Caribbean ownership. As of early 2014, the company had eight boutique cruise ships, each of which carries only 100 to 540 passengers. In 2017, Silversea added the slightly larger (596-passenger) Silver Muse, for a total of nine all-suite ships. Silversea was founded in 1994 by a joint venture made up of V-Ships (previously known as Vlasov Group) of Monaco and the Lefebvre family of Rome. The joint owners had previously been the co-owners of Sitmar Cruises. 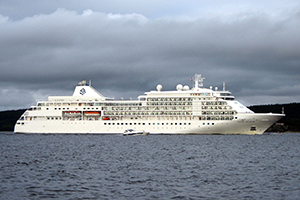 Silversea's business model was to operate ships in the small, all-suite, ultra-luxury category. ...we have a different ship design. It's larger, very seaworthy and very comfortable for ocean crossings--but small enough to do the things you want a small luxury vessel to do, to get into small islands where big ships can't go, to travel up rivers like the Thames. The new line's all-inclusive fares included such features as gratuities, beverages (including cheap/basic wines at lunch and dinner), port charges, travel insurance, and one or more complimentary shore events in every itinerary. 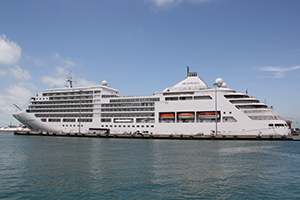 As about 80 percent of Silversea's customers were expected to come from North America, the line established its 170+ employee office in Miami, Florida. Silversea's first ship, Silver Cloud, which entered service in April 1994, was followed in January 1995 by a sister ship, the Silver Wind. In September 2000, the line launched Silver Shadow and Silver Whisper in January 2001. Both of these ships were enlarged versions of the original two ships but carrying about 100 more passengers. In December 2009, Silversea launched the Silver Spirit. Prince Albert II has since been renamed Silver Explorer to align the names under the Silver theme. 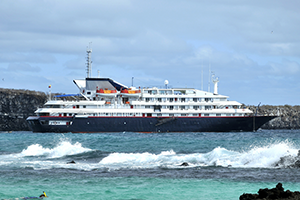 It was announced on 18 June 2012, that Silversea acquired Canodros S.A., the premier Ecuadorian tourism company that operates in the Galapagos Islands. The purchase of the line also included the former Renaissance ship Galapagos Explorer II. The vessel will continue on her planned schedule of cruises and will continue to be operated by Canodros, which is based in Guayaquil, Ecuador. Canodros will also continue handling reservations for Galapagos Explorer II, as well as sales and marketing through its established network of travel companies and tour operators. 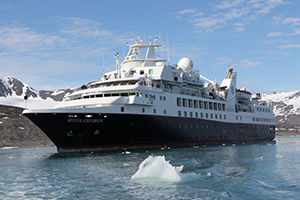 She will be moved into the Silversea Expeditions brand along with Silver Explorer. The Silver Galapagos entered service in September 2013. 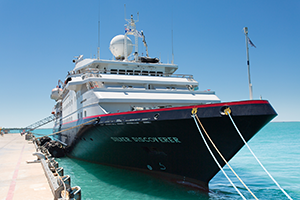 On 10 September 2013, Silversea Cruises confirmed that it would be adding a third vessel to the Silversea Expeditions brand, Silver Discoverer, formerly sailing as Clipper Odyssey for Zegrahm Expeditions. 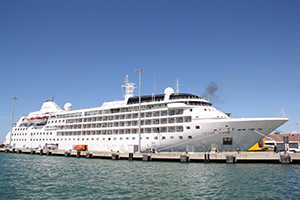 Silver Discoverer was christened in Singapore in March 2014 and set sail on her inaugural voyage along Australia's Kimberley Coast on 2 April 2014. Fincantieri delivered the fleet's ninth ship, Silver Muse to Silversea Cruises on 2 April 2017, at its Sestri Ponente shipyard. 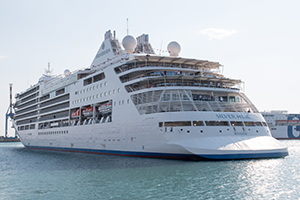 Silver Muse's debut cruise set sail on 10 April 2017, in the Mediterranean. That same year, Silversea announced an order for Silver Moon, a sister ship to Silver Muse, to be built by Fincantieri and delivered in 2020. The company's representative, Silver Whisper, is scheduled to take a 140-day world cruise in 2020. The ship will depart from Fort Lauderdale, Florida on 6 January 2020. 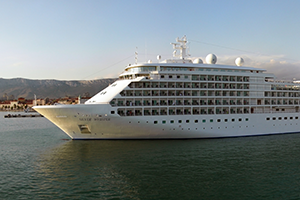 After visiting 62 ports in 32 countries, Silver Whisper will come to Amsterdam on 25 May. In May 2018, Silversea announced an order for Silver Dawn, another sister ship of Silver Muse, to be delivered by Fincantieri in 2021. On 14 June 2018, it was announced that Royal Caribbean Cruises Ltd. had purchased a majority stake in Silversea for approximately $1 billion. Following the announcement, Silversea ordered three new ships: two "Evolution Class" vessels to be built by Meyer Werft to be delivered beginning 2022 and one expedition vessel from Shipyard De Hoop to be delivered in March 2020. Silver Cloud. Built: 1994. In service for Silversea: 1994–present. Gross tonnage: 16,800 GT. Silver Wind. Built: 1995. In service for Silversea: 1995–present. Gross tonnage: 16,800 GT. Silver Shadow. Built: 2000. In service for Silversea: 2000–present. Gross tonnage: 28,258 GT. Silver Whisper. Built: 2001. In service for Silversea: 2001–present. Gross tonnage: 28,258 GT. Silver Spirit. Built: 2009. 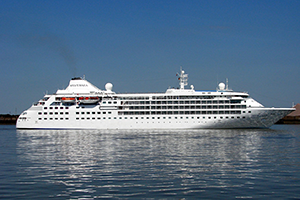 In service for Silversea: 2009–present. Gross tonnage: 39,519 GT. Originally 36,000 tons. Lengthened in March 2018. Silver Muse. Built: 2017. In service for Silversea: 2017–present. Gross tonnage: 40,700 GT. Largest ship built for Silversea. Silver Explorer. Built: 1989. In service for Silversea: 2008–Present. Gross tonnage: 6,072 tons. Previously Delfin Clipper, Sally Clipper, Baltic Clipper, Delfin Star, Dream 21, World Discoverer, World Adventurer and Prince Albert II. Renamed Silver Explorer in late April 2011. Silver Galapagos. Built: 1990. In service for Silversea: 2013–Present. Gross tonnage: 4,077 tons. Previously Galapagos Explorer. Silver Discoverer. Built: 1989. In service for Silversea: 2014–Present. Gross tonnage: 5,218 tons. Previously Clipper Odyssey. Silver Origin. Will be delivered: March 2020. Expedition vessel. Silver Moon. Will be delivered: 2020. Gross tonnage: 40,700 GT. Sister ship to Silver Muse. Keel layed on 15 February 2019. Silver Dawn. Will be delivered: 2021. Gross tonnage: 40,700 GT. Sister ship to Silver Moon. Unnamed Evolution Class Ship. Will be delivered: 2022. The company have won a number of awards including being deemed one of "The 120 Most Trusted Brands" 2014 by Entrepreneur Magazine.